Powered by the DuraPower technology, the Philips BT1212/15 beard trimmer ensures a perfect yet protective trim, time after time. 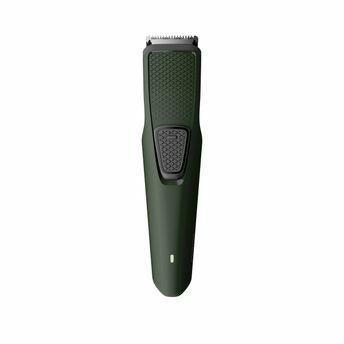 The trimmer steel blades lightly brush against one another, sharpening themselves as they trim so they stay extra sharp and effective as on day 1.The beard trimmer is designed to optimize power consumption so it lasts four times more than regular trimmers. This trimmer is designed to be charged with a micro-USB cable. Once fully charged, this trimmer offers you up to 30 minutes of uninterrupted usage. The DuraPower technology lowers the friction on the blades, which protects the motor and the battery from being overloaded. This way, the battery life time of your trimmer is increased by 4 times. The stainless steel blades sharpen themselves while you are trimming, so you can trim yourself every day as effectively as you did on day one. Long Lasting Performance - DuraPower technology optimizes the power consumption to ensure that your trimmer lasts 4 times longer as compared to an ordinary trimmer. 30 Minutes Cordless Use - Charge your trimmer for eight hours, and you can expect up to 30 minutes of uninterrupted usage. Self Sharpening Stainless Steel Blades - The trimmer steel blades lightly brush against one another, sharpening themselves as they trim so they stay extra sharp and effective as on day 1. Skin Friendly Design - Blades stay extra-sharp to always cut hairs neatly and effectively, and have rounded tips for smooth contact with skin to prevent scratching and irritation. Easy to Clean - Detach the head and rinse it under a running tap once you're done trimming. Battery Charging Indicator - This trimmer comes with a battery charging indicator which lets you know with a green light that your device is charging. USB Charging - Comes with a USB cable for more flexible charging via your computer or any USB adaptor. The adaptor is not included. Built to Last - Comes with a 2 year guarantee. You'll never need to oil it and it's compatible with all worldwide voltages. Additional Information: Philips is a leading health technology company focused to make the world healthier and more sustainable through innovation. The brand is a world leader in home healthcare, energy efficient lighting solutions, as well as male shaving, grooming and oral healthcare products. Focused on improving people's lifestyle by gathering consumer insights to deliver integrated solutions, this brand believes you should be able to enhance your look with the help of technology and innovation. All Philip products are designed to deliver visible results that last - and to empower you to look and feel confident every day.